Our philosophy is based on the belief that the more people we can help to improve their sight, the better. We are not prepared to substitute the quality of our saffron for cheaper imitations of dubious origin. Your ongoing success with our saffron is our success. When I am not tending the crocus plants my wife Leksy and I are full-time carers for my mother. At 87, oooops, now 88, she is visually impaired, partially deaf and shows signs of the onset of Alzheimer's. Taking her saffron each day has improved her sight, lifted her mood as the mild anti-depressant effect kicks in and her memory has improved markedly. I was surprised to read that the spice saffron (in regulated doses of 20 mgs of saffron), was being tested in medical and scientific studies (most recently at the National University of Australia and Sydney University) because of it's apparent ability to not just halt MD but in cases of early detection, actually reverse the physical symptoms. Those participating in the trials acknowledged a noticeable improvement in their vision, some even regained their ability to read. See the testimonials page. "A recent clinical study has shown that taking oral supplementation of saffron for three months in patients with early stage age-related macular degeneration induced a significant improvement of retinal function, creating a hope that saffron may be the natural answer to vision loss from macular degeneration. The effects, however, disappeared when patients stopped taking the saffron pills. No adverse side effects were noticed"
The research team was led by Professor Silvia Bisti (Google her name) and was based on the macular-healing properties of the compounds Crocetin, Safranal and Crocin all of which are found in the crocus flower's 'filament-like' stigma. The beauty of the saffron flower is a hint as to it's amazing healing powers in treating macular degeneration and a number of other vision related illnesses. The stunningly beautiful Crocus Sativus flower is the host for the three long (almost red) Saffron stigma. 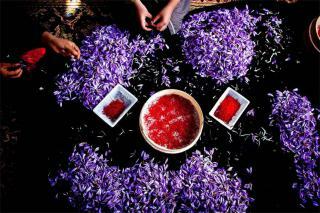 It takes up to 220,000 flowers to make a single kilogram of saffron. 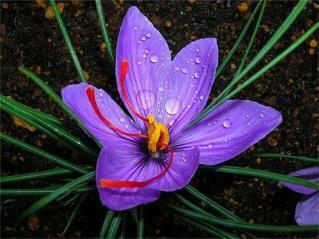 "The unique compounds found naturally in saffron that we believe may have medicinal value include crocin and safranal. 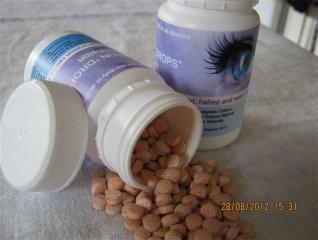 They belong to a family called carotenoids, which includes betacarotene [a type of Vitamin A]. Studies show that these compounds play key roles in preserving eyesight, protecting against cancer and preventing Alzheimer's," she explained. Saffron appears to affect genes that regulate the fatty-acid content of the cell membrane, and this makes the vision cells tougher and more resilient." OK, so that was a very good reason to continue looking into saffron to help my Mum. I continued to research more medical and scientific studies and news articles, all of which were supporting the same astonishing claims. I wanted to start my mother on a saffron supplement immediately but I soon learned that there is 'good saffron' and 'bad saffron' and it was virtually impossible to tell the difference ... this was another compelling reason to grow our own saffron and start www.mdrevisioin.com. .
Poor quality saffron is often dyed to improve it's appearance (and value). Stigma from completely different species (some of which are toxic) were also substituted for Crocus Sativus stigma. Powdered saffron is often 'bulked out' with other substances such as tumeric which has no medicinal value. Saffron loses it's quality with age, exposure to light and if it hasn't been dried, processed and stored correctly. It is extremely labour intensive to harvest and is mainly grown in Iran, Afghanistan, Kashmir, Italy and Spain. "According to figures released by Spain's Ministry of Industry, the country exported 190,000 kilos of saffron in 2010, a sale that netted £40 million. But local production of the tiny filaments from the purple crocus sativis blooms amounted to only 1,500 kilos". Which suggests that if you are contemplating purchasing "so called 'Spanish' saffron" Your chances of getting the real, unadulterated product are less than 1%. To be fair though, if you are contemplating throwing a few threads of Spanish saffron into your rice or paella, it will still probably turn the rice yellow. But to use this saffron for medicinal purposes, I believe, would be criminally neglectful. Saffron stigmas being carefully plucked from the main body of the flower, time consuming but worth the effort when it comes to saving one's eyesight. Saffron stigma being harvested. Each 'filament' has to be individually hand-plucked from the body of the flower. It is a time consuming, labour intensive and therefore extremely costly process. Having discovered all this, I was NOT prepared to settle for saffron of dubious age, origin or quality. To my amazement, I found this most desirable of spices was being grown and harvested very succesfully in New Zealand. But the demand for New Zealand grown saffron was so high, there was none available to buy. At this point, I was running out of options. I took another punt and found Crocus Sativus corms for sale online here in NZ. 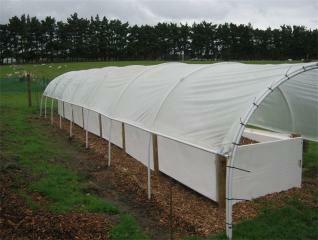 I took a deep breath and purchased a large number of New Zealand saffron corms to start my own saffron farm. And because I needed to accurately produce tablets each containing 20mg of saffron for my Mum, I bought a set of micro-scales from the US and commisioned the manufacture of the 20mg tablets. By growing my saffron in a plastic tunnel house, I can protect the delicate flowers from the elements, ensuring a good crop in the fight against macular degeneration. However, Government regulations state that although I can sell you saffron directly, I cannot promote or make any claims as to it's efficacy re AMD or ARMD. I am not permitted to promote or sell saffron as a treatment. If you choose to purchase saffron from me, you may do so and you are able to use it to whatever purpose you choose. If you or someone you know would like to try our 20 mg saffron tablets, please indicate your interest through the "Contact Us" page. There is a direct email link to me on this page as well. We are now needing to import excellent quality saffron from Australia, as our ranks of saffron users swells. I have produced a small 'saffron drop', a 100mg tablet containing a little more than 20 mg of saffron for daily use @ 1 per day. They taste, well, like saffron ... pretty crappy really. Not to be sucked like a lozenge or a lolly. Three months supply will cost little more than NZ $1.00 per day. We seriously recommend you have your eyes tested and the level of your visual acuity recorded by your specialist prior to joining the hundreds of Kiwis and overseas MD sufferers who are giving saffron a chance to make a difference in their lives. And then get them re-tested again after your first three month session on the tablets. In doing so, you might just make your Eyecare specialist aware that there ARE very positive alternatives to treating MD than those offered today .... treatments that really work. Apparently, Saffron, in very large doses,(i.e. 10 grams in a single sitting) is not recommended for pregnant women. We also advocate against taking saffron in extreme doses.